bl.uk > Online Gallery Home	> Online exhibitions	> Asia, Pacific and Africa Collections	> Malabar Hill [Bombay]. 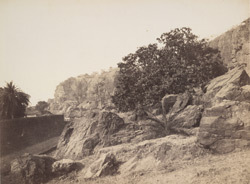 Photograph looking at the eastern part of Malabar Hill, Bombay from 'Views in the island of Bombay' by Charles Scott,1850s. Malabar Hill, the highest point in Bombay, is where the Silhara Kings (r.810-1260) founded the original Walkeshwar Temple. The temple was destroyed by the Portuguese and rebuilt in 1715 by Rama Kamath. By 1860, the temple attracted many people and there were 10 to 20 other temples around it and 50 dharamshalas. Fairs were held near the temple. Mountstuart Elphinstone built the first Bungalow in Malabar Hill during his governorship from 1818 to 1827. After this many more people built houses here and the area became a posh locality which it still remains.